The term "Carpet beetles" includes several species of Dermestid beetles that commonly feed on animal-based textile products. 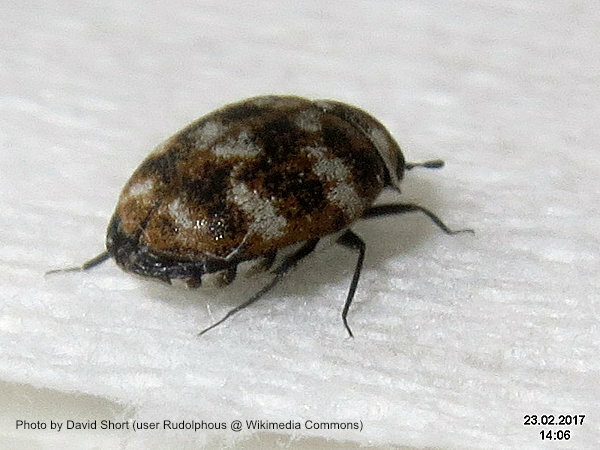 These species include the black carpet beetle, the varied carpet beetle (shown here), the common carpet beetle, and the furniture carpet beetle. All of these beetles are small, averaging between 1/16 and 3/16 of an inch (0.16 and 0.019 cm), have similar biology and habits, and cause similar damage. The term "carpet beetle" itself is somewhat of a misnomer. Although often found eating carpet fibers, carpet beetles will attack almost any animal-derived material including woolen clothing, tapestries, woolen blankets, upholstered items, furs, feathers, down, pet foods, and even animal and bird carcasses in attics, crawl spaces, and basements. They may also attack "mixed" foods that contain both animal and plant products (such as dry pet foods); and if they get desperate enough, they may even eat strictly plant-based foods such as cereals, grains, and nuts. They can also damage synthetic fibers that are stained with animal by-products such as food stains, sweat, body oils, blood, or other bodily fluids. 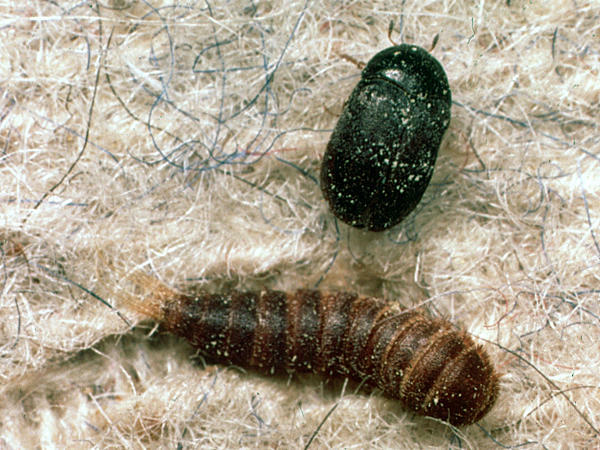 Like all beetles, carpet beetles undergo complete metamorphosis (egg, larvae, pupa, adult). 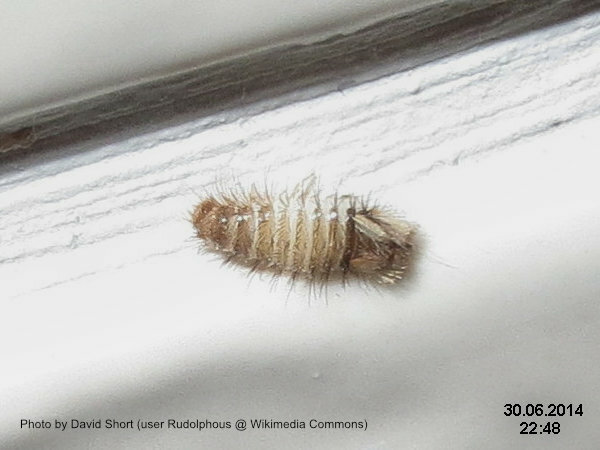 In the case of carpet beetles, it is the larval stage that does the damage. Adult females deposit their eggs on or near susceptible fabrics or other products. The eggs hatch in about two weeks, and the larvae feed on the animal-based fibers of the fabric until they go into pupation. The larval stage can last anywhere from six weeks to six months after they hatch, depending on environmental factors such as temperature and availability of food. The pupation process can take anywhere between three days and three weeks, after which the adult beetles emerge. The adults don't damage textiles. They feed on pollen, nectar, and other sugary liquids, and live an average of one to three months. Non-chemical control is the first and most important step of achieving lasting control of carpet beetles, beginning with a thorough inspection. You or your PCO should thoroughly inspect the home to determine where the source of the infestation is located and exactly what the beetles are eating. Once the source of food is found, it should be cleaned if it is something of value, or discarded if it is not. For example, if the beetles are found to be feeding upon clothing, then the clothing items should be washed or dry-cleaned. If they're eating the carpeting, then it should be thoroughly vacuumed and shampooed or steam cleaned. If they're eating a dead mouse or bird, then the carcass should be removed and discarded and the area in which it was found thoroughly cleaned and sanitized. In many cases, removing the food source any existing larvae will be all you have to do to solve a carpet beetle problem. In some cases, insecticide treatment may be necessary as an adjunct to non-chemical control. Due to the difficulty of properly treating a carpet beetle infestation, you may wish to hire a professional pest control operator to perform this part of the treatment. It's not that carpet beetles are especially hardy or resistant to insecticides. They're not. What's difficult is figuring out where to apply the insecticide and getting it where it needs to go. This is especially true if the carpet beetles are actually eating the carpeting. It can be difficult to get the insecticide into the pile and foundation of the carpet without over-applying it. If you choose to perform the treatment yourself, select an insecticide labeled for the control of carpet beetles in the area that you will be applying it (for example, in homes), and for the surface on which you will be applying it (for example, on carpeting). Before applying the insecticide to any textile item, test it on a small, inconspicuous area to check to see if it causes any staining or other damage. Always be sure to read, understand, and follow all label instructions when using any pesticide product. For treatment of carpeting, you really should use a professional-quality compressed-air sprayer capable of delivering both pin-stream and flat-fan spray patterns at fairly high pressure. These sprayers are not cheap, but they'll maximize your chances for success. They'll also last pretty much forever if you take care of them. The only one I'd recommend a the time of this writing would be the B&G N124-S-18. This sprayer and its previous models have been used by professional exterminators for generations. I'm not aware of any consumer-grade sprayers that are able to deliver as accurate a flat-fan and a pin-stream pattern. Thoroughness and precision are important when treating carpets. You should treat the areas known to be infested, as well as the immediately adjacent areas for about three feet (roughly a meter) in each direction. Use the flat-fan tip for spraying the carpet itself, moving along in rows as if you were a farmer spraying a field, using a pressure of about 40 to 45 psi (about 275 to 310 kPa) to force the insecticide into the pile and foundation of the carpeting without saturating it. Also pay special attention to cracks, crevices, and other protected places that may harbor beetles or their larvae, and treat those areas using the pin-stream nozzle at a much lower pressure of about 20 to 25 psi (about 138 to 172 kPa). Remember that over time, fibers from carpeting and other textiles may have shed off and become embedded in crevices under baseboards and in other hidden areas. These shed fibers may be sustaining beetles, so the cracks and crevices have to be treated. Because insecticides generally are ineffective against the egg or pupal stages of insects, it may be necessary to retreat the infested areas once or twice to control newly-emerged adults who were eggs or in pupation during the original treatment. Using the Gentrol IGR will usually limit this to one treatment. If you choose not to use it, you'll most likely need two retreats. Unless the label for the insecticide you're using states otherwise, I suggest performing the second treatment about two weeks after the initial treatment. Always read and follow the label instructions when applying any pesticide.